The Deluxe Brushed High Back Stool Grey cuts a tempting figure with its chic modernity. Sure to wow, the Deluxe Brushed High Back combines the contemporary with the comfortable, resulting in an elegant, efficient, and endlessly incredible bar stool. 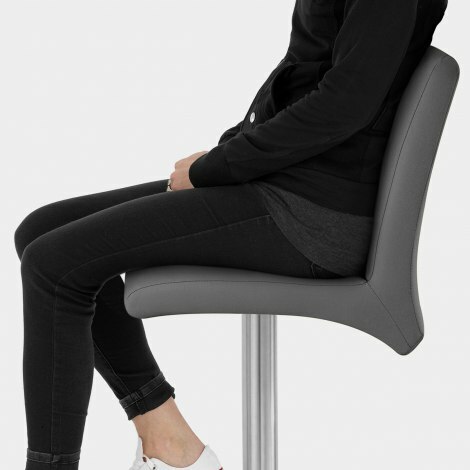 The high backrest dips below the seat, producing a stool that's visually funky and is covered in grey faux leather for comfort and style. Its brushed steel finish quietly complements kitchen appliances and turns the stool into something that blends in as brilliantly as it stands out. The distinctive T-bar footrest is hand-crafted and adds to the Deluxe Brushed High Back's designer appeal while a number of features compound its strengths. A protective rubber rim encircles the stool's underside. "Lovely looking stools that look very classy"
I have three of these at my breakfast bar in my apartment and they look really nice. I'm usually fussy about having real leather but these faux leather are almost the next best thing in terms of quality. Excellent service from Atlantic Shopping. The stools came quickly and we were kept informed all the way. Very pleased with the stools good quality and very comfortable. Great bar stools very comfortable reasonably priced and quick delivery really pleased with purchased. Very pleased...they are comfortable with high back and they are useful as spare dinning chairs at dinner table. Customer services helped with purchase as could not find stools that went down as low as these. I love these they look really classy in my new kitchen. I was looking for something with a high back that was comfortable to sit on for a few hours as this is the only seating in our kitchen & where everyone always gathers for a coffee & chat. They were easy to put together & quick delivery. Lots of people commenting on how nice they are.